This year I had a goal- take less “portraits.” I know that sounds ridiculous but I was swooning over the images I was seeing on Pinterest- full of love, fun, emotion. And my photography runs on emotion. If you give me a love story, a trauma, even a fairytale, what I can create for you exceeds what I work off of when I’m just running on colors of clothes. With Kaley and Shawn I got the most adorable love story! They’ve been together since they were young (as if they’re old now... haha) and got married, moved, and Shawn enlisted in the military before they were even 20. I loved watching their love story unfold as the images popped up in my facebook feed over the years. Kaley came to me for her Senior Portraits nearly 4 years ago and she was a beauty back then. Not much has changed. Fast forward to now. 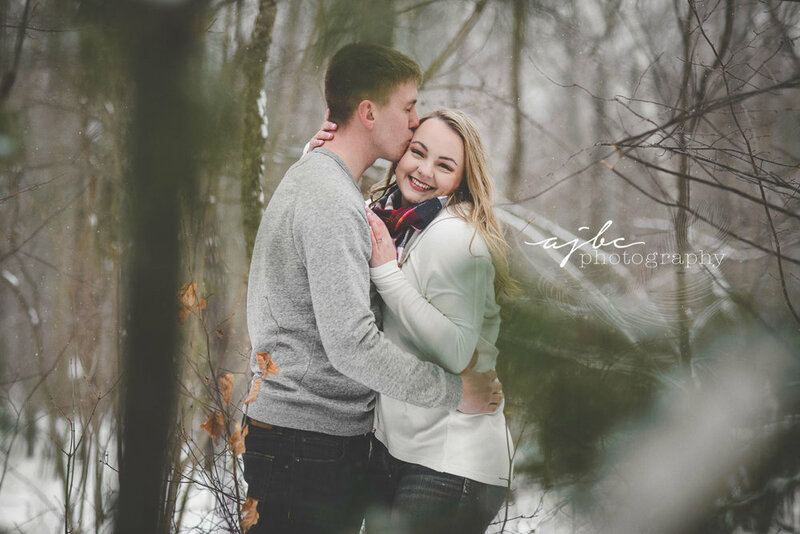 They were home visiting from the sunny, warm state of Texas and booked a shoot in Michigan with AJBC Photography in the dead of Winter. Snow, deep snow, and below freezing temps, way below, just a touch above zero. We grabbed a warm blanket, headed out to the forest and I just watched them enjoy each other, snuggling, dancing, smooching. I didn’t need to ask them to “act like they like each other” like we’ve had to do with so many couples in the past. It felt so good to photograph people just being themselves. I’ve never been one for awkward stiff posing, but I’m losing that “posing” side of me even more, and I love it!! Check out our full Lovers Gallery! If you like this love in the snow look check out Jen & Zack's Session! If you like this outdoor feel check out Casey & Evan's Engagement Photoshoot!